Business managers in a recent study said that administrative tasks consume two days every week. These redundant, yet important, tasks that insurance agents spend time on include: policy renewals, lead follow-up, monitoring policy application statuses, new client onboarding, and paperwork in general. When these tasks are handled manually, it’s not only inefficient, but there’s the possibility that important steps are missed. Every agency operates differently. AgencyBloc’s Automated Workflow allows agencies to create customized workflows, increasing efficiency and ensuring accuracy in their processes. What exactly is Automated Workflow? Think about the things you do that are vital to an agency running smoothly, like following up with leads and being proactive on policy renewals. Tasks like these often follow the same process repeatedly and can, thus, be made into an Automated Workflow to save you time. Let’s take a Group Policy Renewal for example. Without automation, the group’s account manager either has the policy renewal date on a calendar somewhere or within an Excel spreadsheet. When they see the date approaching, they might write a sticky note reminder to themselves to email or call the Group client to chat about the renewal process. What follows is a string of manual emails or attempting to remember what’s been done for the renewal and what needs to be done next. "Workflow automation is an essential part of our agency’s success. By having the proper workflows in place, not only does it save my administration and agents time, but it also helps us in staying in front of our clients with email automation, policy retention and much more," says Ken Brannigan, Owner/Agent of Senior HealthCare Solutions. Automation allows your agency to transition from manual processes that are inefficient to automated processes that keep people on track and prevent important activities from falling through the cracks. Each agency’s needs are different. The best way to see how this could benefit your agency is to sign up for a personalized demo where you can speak one-on-one with our sales team about your needs and take a peek inside the system for yourself. Schedule a 1-on-1 demo to chat with an expert about how your agency can benefit from Automated Workflow. Workflow automation is an essential part of our agency’s success. 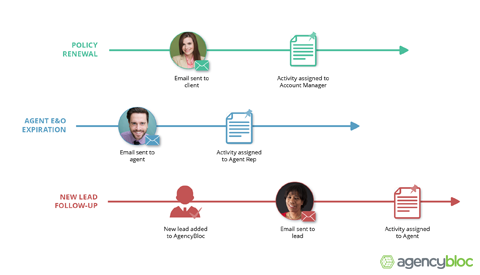 By having the proper workflows in place, not only does it save my administration and agents time, but it also helps us in staying in front of our clients with email automation, policy retention and much more. 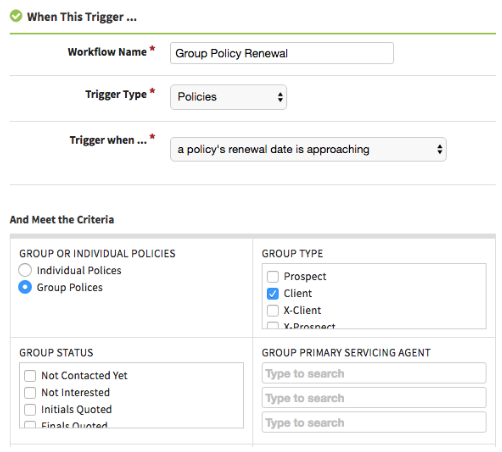 Schedule a 1-on-1 demo to see how Automated Workflow could meet your agency's specific needs.